tool cell. The net is then saved under the current name (the one shown in the index). The size, position, and contents of binders that are open are saved. The pan and zoom information for pages and declarations that are open in binders is also saved. 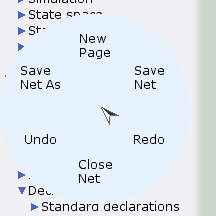 Select the Save Net entry to save the net under the current name. 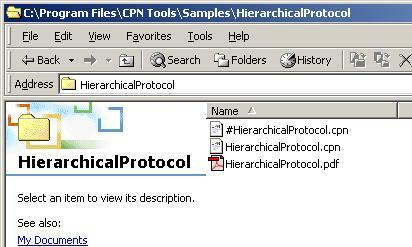 If this is the first time the net is saved, a file dialog will appear. You can save the net under a different name by text editing the net name in the index. When you exit text editing (by clicking somewhere on the background), the net is saved under the new name. The location of the net is the location of the place where you last saved. If the net has not been saved yet, editing the name of the net will not save the net. tool to the net name in the index. A dialog will appear where you can select a different location and/or change the name of the net. Select the Save Net As entry to bring up the file dialog where you can change location and/or name of the net. To see where the net is saved, hold the mouse (do not click) over the net name in the index. A tool tip appears, telling you where the net is saved. All open nets are periodically saved in backup files. The files are saved after a given number of commands have been executed. The number of commands between autosaves is one of the Options that can be changed in the Index. If the name of the net is <filename>, then the name of the backup file is #<filename>. The backup file is saved in the same directory as the file. The backup file is deleted when the net is saved or closed.